Run Junkie: Ultra on Three Runs a Week? Sure. Ultra on Three Runs a Week? Sure. I sit here writing ensconced in the good life of the off season - "You've gained how many pounds already?" one good running buddy asked the other week. 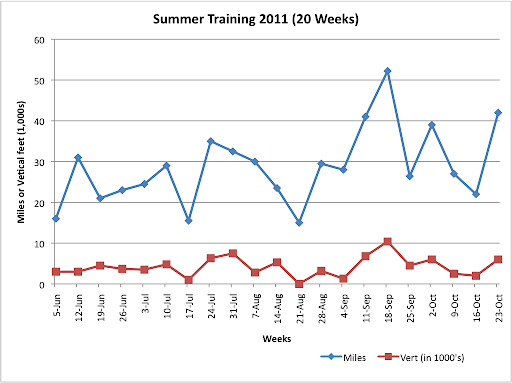 Yet, with dreams of 2012 starting to dance in my head, it seemed time to do a little post facto analysis of my training in the 2011 high season. After a disappointing and pretty much non-existent 2010 season because of my too-documented knee injury, I thought I'd take a different approach to 2011 that allowed me to keep the knee happy with low weekly miles but let me do what we all love most - going long. So, for most of the summer I ran only three times a week, slowly kicking up my long runs until I hit respectable distances of 18 - 20 miles. While it made for some rough runs as my slow-to-develop fat-burning chemistry came online, it worked amazingly well, letting me get out on some of the most memorable training runs I've ever had - documented ad nauseum in images on singletrack:photos. And as the knee showed some resilience, I took the plunge, setting my sites on a late season 50k (my first ultra since Wasatch Front 2009) and kicking up the training just a bit in September. For the 20 weeks between early June and race day on October 22, I averaged 30 miles/week; 4,400 vertical feet/week; and 3.5 runs/week. My biggest week ended September 18, with 52 miles, 10,400 ft vert, and 5 sessions - numbers that in the past passed as a recovery week. Season details in figure below. For ultra - even for a 50k - it was meager training, but it worked surprisingly well. I had a solid race and finished feeling strong in 5:23 and 18th overall. Not contending but not lagging, either. As a once and (maybe) future mileage junkie, I'm always hoping for more, but I think this past season serves as a great lesson that low miles, if they're smart, can take you a long way toward your goals. I'm not sure what 2012 will hold - I'd love to do a 50 miler - but 2011 has been a real gift - allowing me to dip my toes back into the sport I love. 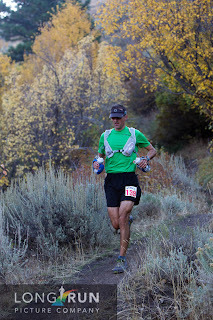 You should check out some of Barefoot Ted's postings about his training he does for the ultra's he runs. It shocks me how little he puts in to it. I ran my first two 50Ks on about two runs a week, one of them over twenty miles generally. Neither of them ended well, though I was never miserable. For my third 50K, I got scared into training a little more, about 40 miles a week in about four runs for 8 or so weeks. I ran my best and fastest race, 5:50. I'm glad to see that I'm not crazy.